THE STORY - Nineteen-year-old Ben Burns unexpectedly returns to his family's suburban home on Christmas Eve. Ben's mom, Holly, is relieved and welcoming but wary of her son's drug addiction. Over a turbulent 24 hours, new truths are revealed, and a mother's undying love gets put to the test as Holly does everything in her power to keep Ben clean. 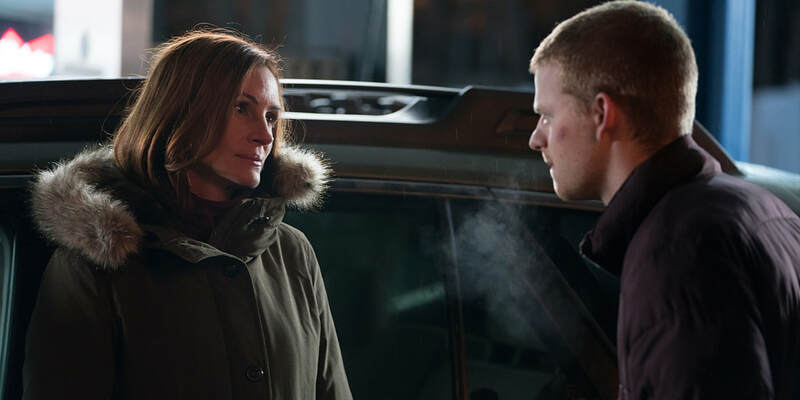 THE GOOD - Phenomenally emotional performances from Julia Roberts and Lucas Hedges. Powerful and authentic look at addiction. THE BAD - The film takes a drastic turn in tone in the second half that never fully clicks. ​​​After "Beautiful Boy" premiered earlier this year to lukewarm reactions, in comes "Ben Is Back," another addiction family drama that suffers from its own share of problems but nonetheless also provides an acting showcase for its two stars and serves as a powerful statement on familial love for those suffering from addiction. Oscar nominee Lucas Hedges (one of the most exciting young actors to emerge over the past few years) turns in his best performance yet as the teenage addict Ben who desperately tries to shield his family from his addiction despite his efforts at staying clean. Julia Roberts plays his mother who is sympathetic towards her son and always willing to go to bat for him even when her husband Neil (Courtney B. Vance) and daughter Ivy (Kathryn Newton) are more skeptical. Upon returning home unexpectedly and unannounced from rehab on Christmas Eve, Ben expresses a desire to reintegrate himself back into his family's lives even though they are almost done giving him second chances. After some tense discussions between Holly and Neil (who is not Ben's biological father), Ben is allowed to stay with the family for Christmas but for only 24 hours under his mother's supervision, before going back to rehab. Everything seems to be going well for the once happy and whole family until a late night break-in by an unknown party leads to their dog being kidnapped. Ben and his mother proceed to go door to door in the middle of the night, confronting Ben's past and trying their best to find their dog and return it home before Christmas morning. Not since "The Book of Henry" have I seen a movie which takes a dramatic shift in tone at its halfway point as "Ben Is Back" does. What starts out at first as an addiction-family drama, with horrific past events which are cryptically referenced through unspoken dialogue, the tension between the family members and nuances in their performances, turns into a completely different movie which almost resembles a crime drama at times as dangerous people from Ben's past find out he's back home and are looking to settle a debt with him. The film is definitely stronger when it focuses less on its genre elements and instead turns itself towards the performances by Lucas Hedges and Julia Roberts. If it weren't for them and their extraordinary work, I fear the film would've gotten too lost, much like the characters as they search for their dog with very little leads to go on. While Peter Hedges directs his actors to some emotionally heavy places and establishes a somber tone with the desaturated blue/grey color palette of the film, his writing starts to lose focus in the second act. it also does not help that the cinematography is consistently flat throughout, with uninspired lighting and awkward handheld moments that don't feel artistically earned or used well enough to establish tension. "Ben Is Back" gets a lot of the details about addiction correct, whether it's old triggers, social pressures brought upon by other users or a family's wavering (yet undying) love. Granted, writer/director Peter Hedges, his son Lucas and Julia Roberts don't turn in a perfect film by any means. Instead, it's a messy one fit for a messy situation with no real end in sight for its characters. Lucas Hedges and Julia Roberts are certainly worth the price of admission alone and there are a number of sequences which will surely make you tear up such as a scene at a local graveyard where Holly demands her son to "Tell me where you want me to bury you" or the film's final suspense-filled shot. "Ben Is Back" may not be the shot in the arm that moviegoers need right now but it has a beating heart that is worth putting forth the time and effort in for.